The film deals with the disaster that big dams cause to human settlement and is based on the disaster that struck China when the Banqiao dam burst in 1975 and claimed the lives of almost 250000 victims. The film's in the controversy whirlwind right now. 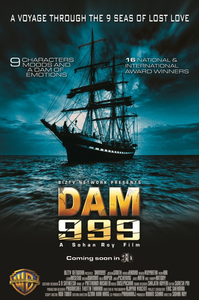 The Tamil Nadu government banned Dam 999, claiming that the film was about the contentious issue of Mullaperiyar dam and delivered a message in favour of Kerala. Seriously, if at all there was a film that had to be one of the most confused, incoherent and pointless affair this year, it had to be 'Dam 999'. No wonder, just like the basic plot of the film, it would always forever remain as a mystery that how are such films ever made. Dam 999 starts at Marine City - architecturally inspired by Manipal University ads - where Capt. Freddie Brown is launching a book, titled DAM 999, that recounts the horrors of a dam-burst in Kerala. Dam 999 will prove to be a poor fare at the box office. Dam999 could make for an interesting watch had it just stuck to what it was supposed to be. In its present form it's easily avoidable.